North Bengal comprising the districts of Jalpaiguri, Darjeeling, Dinajpur and Cooch Behar lies at the foothill of the great Himalayas. The area covers the moist and dense riverine forests of the Bengal Dooars (Duars) and the stark foothills of the snow-capped Kanchenjunga range. The unique climatic and ecological conditions makes North Bengal an unique home for a large variety of mega-fauna & superb restricted bird species. Bhutan and Nepal are two beautiful countries having an easy access from North Bengal. Sikkim previously an independent country joined union of India later on as one of its states. All these three beautiful places are all adjacent to parts of North Bengal. North Bengal is a term, for the parts of Bangladesh and West Bengal. The Bangladesh part denotes the Rajshahi Division. Generally it is the area lying west of Jamuna River and north of Padma River, and includes the Barind Tract. The West Bengal part denotes Cooch Behar, Darjeeling, Jalpaiguri, North Dinajpur, South Dinajpur and Malda districts together. It also includes parts of Darjeeling Hills. Traditionally, the Hooghly River divides West Bengal into South and North Bengal, divided again into Terai and Dooars regions. This region comprising the state of Sikkim and the adjoining parts of North Bengal - Darjeeling and Kalimpong, is a rugged strip of vertical mountain country. Wedged between Nepal, Tibet, Bhutan, and the North Bengal Plains of India. This tiny region is just 90 km wide and 150 km deep. The grain of the country rises from near sea level to 8500 meters, in a short distance, The great Himalayan Range with its giant spurs – Singelila and Chola, virtually enclose this region in a titanic horseshoe. Starting from the plains of North Bengal tangled interlacing ridges rise range after range to the foot of the great wall of high peaks and passes opening into Tibet, Nepal and BhutanThe climate varies between the tropical heat of the valleys and the alpine cold of the snowy regions. With rainfall averaging 348 cm, it is the most humid region of the Himalayas. Dry season is from November to April. The altitudanal zones of vegetation range from tropical, sub tropical, temperate to Alpine – some places only 10 km in a direct line separates the palm growing valleys from perpetual snow. The varied terrain - from the pleasant humid foothill valleys below 1000 meters, to the arctic cold of the snow capped peaks up to 8000 meters, has created marked altitudinal zonation in the humidity, rainfall, climate and vegetation. 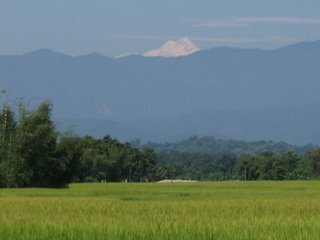 The Terai ("moist land") is a belt of marshy grasslands, savannas, and forests at the base of the Himalaya range in India, Nepal, and Bhutan, from the Yamuna River in the west to the Brahmaputra River in the east. Above the Terai belt lies the Bhabhar, a forested belt of rock, gravel, and soil eroded from the Himalayas, where the water table lies from 5 to 37 meters deep. The Terai zone lies below the Bhabhar, and is composed of alternate layers of clay and sand, with a high water table that creates many springs and wetlands. The Terai zone is inundated yearly by the monsoon-swollen rivers of the Himalaya. Below the Terai lies the great alluvial plain of the Yamuna, Ganges, Brahmaputra, and their tributaries. The Dooars or Duars are flood plains at the foothills of the eastern Himalayas in North-East India around Bhutan. Duar means door in both Assamese and Bengali languages and forthe Bhutanese people can communicate with the people living in the plains. This region is divided by the Sankosh river into the eastern and the western Duars consisting of an area of 8,800 square kilometer (3,400 square-mile). This region was controlled by the Kingdom of Bhutan when the British annexed it in 1865 after Bhutan War. They are now part of the Indian states of Assam and West Bengal.Many wars have been fought over them. These plains are very fertile. There are innumerable streams and rivers flowing through these fertile plains from the mountains of Bhutan. In Assam the major rivers are Brahmaputra and Manas, and in northern West Bengal the major river is the Teesta besides many others like the Jaldhaka, Torsha, Sankosh, Dyna, Karatoya, Raidak, Kaljani among others.The forested areas of Northern West Bengal present a plethora of Wildlife.This mixed dry deciduous forest land dotted with grasslands, harbors the largest diversity of mega fauna in West Bengal. A large range of foothill forest in North Bengal is called Dooars. Once the whole area was under the reign of Koch Raj. Tea Gardens, alpine landscape, transparent river, National Parks and the Wildlife Sanctuary creates a paradise. Beautiful motorable roads cut through deep forests, rich with wildlife. Mauve hills stand at the end of velvet green plains. The forests echo with the melody of birds. In between, there are fabulous wildlife sanctuaries with, log cabin lodges and valleys carpeted with tea gardens. Dooars is the habitat of the rare Toto tribes. The most convenient entry point to Dooars is through Siliguri by road. Regular bus connections between Siliguri and most important spots in the Dooars. Also broad gauge rail connection between New Jalpaiguri and Mal, Madarihat, Nilpara, Jainti, Mainaguri, Dhupguri and Falakata. Metre gauge rail connection between Siliguri and most spots. Dooars Jungle in North Bengal are:- Buxa, Gorumara, Jaldapara, Neora Valley, Bindu, Jaldhaka, Jhalong, Malbazar, Samsing The state has 4031 sq. Km. of forests, under protected area network which is 34% of the State's total forest area and 4.54% of the total geographical area. There are five National Parks, fifteen sanctuaries, two tiger reserves and one biosphere reserve. The PA network includes 1055 sq. km. of sanctuaries, 1693 sq. km. of National Parks, the balance are being represented by buffer areas of the two tiger reserves, viz. Sunderbans Tiger Reserve and Buxa Tiger Reserve. Habitat loss has largely taken place due to human intervention and change in land use pattern. Large scale conversion of natural habitats for a variety of purposes have led to shifts in floristic pattern (like in case of weed flora) and also fragmentation and loss of natural corridors for animals, leading to man-animal conflict. After the armed conflict with China in 1962, for example, the Army has been permanently stationed in Binnaguri, which has led to loss of the elephant corridor. Similar is the case of tea gardens in North Bengal, which have also witnessed man-animal conflict after forests were clearfelled. Habitat loss has led to decline in several species, and fauna like otter, Bengal jackal, pangolin, mongoose, porcupine are among those which are not frequently sighted today. Much needs to be studied about the underlying inter-relationships between biodiversity and the anthropogenic element, to clearly establish how harm to flora and fauna as a result of human interference must be stemmed. The jungles of North Bengal is an extremely rich biodiversity zone but today faces, a declining rhino population, political unrest in the entire zone and incidences of elephants being hit by speeding trains in their migratory corridors are some of the glaring issues. In the face of industrial resurgence, land acquisition has become a grave issue, The locals are least concerned about preserving the forest ecosystem. Efforts are on to set up a tourism development centre in the area that will hamper the forest biodiversity. Industrialisation has a considerable impact on environment. Another disturbing environmental site is the East Calcutta Wetlands that has been declared a Ramsar Heritage Site but is poorly maintained. In the tea gardens of the Dooars, huge amounts of pesticides are used that have a damaging effect on the floral biodiversity. All’s not well in the jungles of North Bengal with recent incidences of loss of an increasing number of wild fauna and the major factors contributing to the depleting wildlife habitat are lack of proper administration by forest officials and hazardous methods of conservation. The North Bengal forests are reeling under severe crisis owing to the threat from the fringe populace residing in and around the plains of the Dooars. The tension brewing in the tea sector has caused misery for a huge section of locals and this is creating increased pressure on the forest resources. There are other prevailing threats that are posing a danger over a considerable period of time, including excessive grazing that has not been taken care of. The rising conflict between man and animals has placed certain prominent categories of mammalian species in jeopardy. The rapid tourist influx has also degraded the environmental scene in North Bengal since it generates a lot of non-biodegradable wastes in the hilly areas. Efficient treatment and recycling of waste will provide a source of livelihood for locals, make the environment safe and clean and will be a draw for travellers. The forests of West Bengal are classified into seven categories viz., Tropical Semi-Evergreen Forest, Tropical Moist Deciduous Forest, Tropical Dry Deciduous Forest, Littoral and Swampy Forest, Sub-Tropical Hill Forest, Eastern Himalayan Wet Temperate Forest and Alpine Forest. The state has a recorded forest land of 11,879 sq. km., of which 7,054 sq. km. is Reserved Forest, 3,772 sq. km. is Protected Forest and 1,053 sq. Km is Unclassifieded State Forest, thus constituting 13.38% of the geographical area of the state. Under the conservation and protection regime the State has one Biosphere Reserve, two Tiger Reserves, five National Parks and 15 Wildlife Sanctuaries. Four out of five National Parks are located in the North Bengal along with one tiger reserve and seven Wildlife Sanctuaries. The Neora Valley National Park, spread over an area of 88sq.km. in the Darjeeling district of West Bengal was established in April 1986. The park, a unique area of rich bio-diversity lies in the Himalayan foothills and is bordered on the east by Western Bhutan and the forests of Neora Valley, one of the least tracts of virgin wilderness in the country sustains a unique eco-system where tropical, sub-tropical, sub-temperate, and temperate vegetative system still harbours a wealth of flora and fauna. The Buxa Tiger Reserve with an area of 759 sq. km was established in the year of 1982-83 at the north eastern corner of West Bengal bordering Bhutan and Assam. The core area of 315sq.kms around the Buxa Duar Fort was declared a National Park in January 1992. This park is located in eastern Dooars (rolling humid plains) at 2600 ft above sea level. 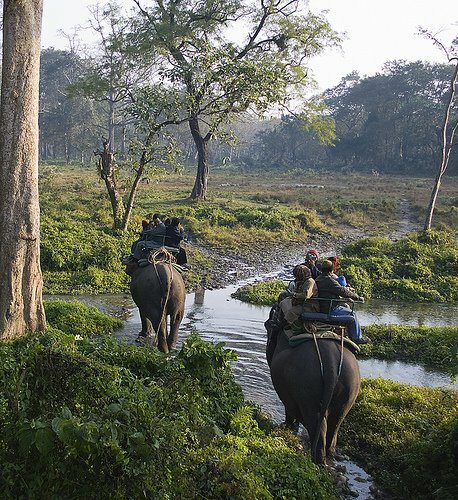 The Dooars comprises of deciduous forests which are densely wooded and grasslands and is home to some of West Bengal's most varied flora and fauna. The vegetation of these virgin forests mainly alpine, changes with the range in altitude. The main tree species found are the Rhododendron, Magnolia, Oak, Hemlock, Silver Fir, Juniper, Mailing Bamboo, Buk, Kawla, Bhujpatra etc. Other flora includes primulas, aconitums, gentians, arisaemas and orchids adorning the forest clearings. The fauna found in the park are leopard, serow, pangolin, elephant, chinkara, red panda, barking deer etc. The park has a variety of birds such as pigeons, doves, sibia, minivet, magpie, cuckoo, hornbills, Kaleej pheasants and a large number of migratory birds. Gorumara National Park is located in the Dooars (rolling hill slopes) region of Jalpaiguri district in West Bengal. This small forest area famous for its natural population of the Great Indian one horned Rhinoceros was declared a wildlife sanctuary in the year 1949. Later in the year 1992, it was established as a National Park, comprising 80 km of diverse forests. The sanctuary lies amidst the idyllic surrounding created by the mysterious backdrop of the Mountains of Bhutan and the confluence of river Torsa and Malangi. The sanctuary covers an area of 100sq.km. The park is the home of several wild lives, which includes the famous one horned Indian Rhinos, Swamp Deer, wild boar, leopard and tigers. The sanctuary has the maximum number of one-horned rhino in India after Kaziranga. The park has excellent facilities for wild life enthusiasts. The varied terrain - from the pleasant humid foothill valleys below 1000 meters, to the arctic cold of the snow capped peaks up to 8000 meters, has created marked altitudinal zonation in the humidity, rainfall, climate and vegetation. This factor is responsible for the great variety and abundance of the resident bird life, making this area arguably one of the richest areas of its size anywhere in the world. 527 species of resident birds have been recorded. In addition there are vagrants, and transients on migration. It is estimated that more than 30 percent of the species of the Indian Sub continent can be spotted in this region. Lava and Neora Valley National Park are the prime birding destinations in North Bengal. Located 35 Kms from Kalimpong, it is surrounded by very large tracts of protected forests ranging in elevation between 1600 and 2400 m. There are several sites for bird watching and photography around Lava and the adjoining Neora National Park. Some of the rarities that can be found at Lava are : Satyr Tragopan, Rufous-throated and Spotted Wren Babblers, Yellow- throated Fulvetta, Ashy wood Pigeon, Red – Faced Liocichla, Blue-fronted Robin, Long-billed thrush, Cutia, Rusty-belied shortwinged, various Laughing Thrushes ,Warblers and Sunbirds.